When fighting the government on behalf of clients, Houston criminal attorneys James Sullivan and Associates often face prosecutors who will not change their minds no matter how illogical or unreasonable their theory of the case seems. Much like happened to Amanda Knox in Perugia Italy, there are prosecutors in some cases that just continue to hold on to their untenable theories even when physical evidence and even testimonial evidence does not support it. Prosecutors take an oath to see that justice is done. Justice frequently requires that criminal and juvenile cases be dismissed. When prosecutors do not see the light and dismiss the case, then good Houston criminal lawyers take the case to a jury trial. 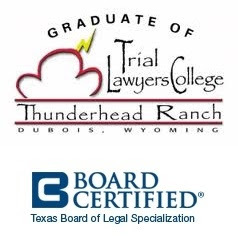 James Sullivan is Board Certified in Juvenile Law by the Texas Board of Legal Specialization. Juvenile Law is different than criminal law. If you need a Houston felony lawyer who will fight your case at trial, you can call Attorney James Sullivan at (281) 546-6428.